The Oxford, Appolonia City’s first turnkey residential development, has sold 85% of its first phase, with a group of homeowners expected to move in this year. The second phase of The Oxford is 15% pre-sold, with construction set to commence in June. These 93 homes will come with solar roof panels and free set top boxes to connect to the internet, as well as on-demand services. The Oxford is a residential estate within the Appolonia City’s mixed-use development, with plans for 420 houses across a total area of 20 hectares (49 acres). The turnkey development, which targets middle-class buyers, is a joint venture between Imperial Homes and Rendeavour, Appolonia City’s developer. “We are committed to providing world-class infrastructure to developments such as The Oxford and believe that we will see more developers situate their projects within Appolonia City,” said Bright Owusu-Amofah, Appolonia City’s CEO. In October last year, The Oxford received a major boost through an off-plan purchase of 30 units from a British consortium led by prominent British investor Simon Edwards. The Oxford offers flexible payment plans, between 6 and 24 months. One rapidly progressing amenity for The Oxford residents is Golden Pride International School, currently under construction and set to open in September 2019. 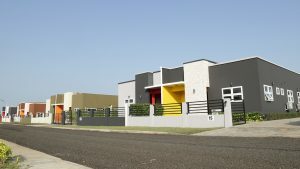 Buyers who wish to accelerate a move to The Oxford may contact GHL Bank, Ghana’s largest mortgage provider, which offers 15-20 year mortgages for The Oxford homes.